Pagans are a relatively non-superstitious lot in their way. They embrace personal practices most were taught to fear by the religions and non-religions of their dominant cultures. Yet in the United States Pagans remain bizarrely superstitious about one magical tradition that actually has its strongest roots in North American soil. Hoodoo, primarily African-American folk magic with a deep and rich ancestral heritage that crosses multiple ethnic and racial lines, scares the living crap out of the average white Pagan practitioner. What makes this particular superstition interesting is that at least a portion of these same frightened practitioners embrace traditional witchcraft and hedge witchery. The folklore of these witchcraft traditions hails from the British Isles and Europe, and they share parallel influences when it comes to both ethics and ancestry. Many of the witchcraft practices that evolved in Europe – or were preserved, depending on your point of view – came from a similar (though not the same) response to oppression and the need to survive. If a person looks deeply enough, even the oft-offensive question/concern about “animal sacrifice” in hoodoo practices shares the same reasons if not the same roots as it did in traditional witchcraft. Nobody wants to sacrifice a chicken they could darn well eat, and whether a member of the British underclass in feudal Europe or a plantation slave, either practitioner sacrificed that chicken for a magic working because she (or he) felt like s/he darned well had to for survival with a need so great it outranked having a food source. 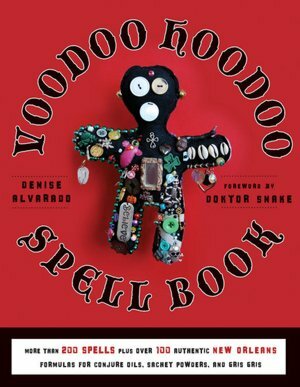 Denise Alvorado’s book The Voodoo Hoodoo Spellbook shares her knowledge of both Voudon and Hoodoo with the greater community by providing a handy reference. She also provides greater context for the religious foundations of Voudon and provides context omitted by the notorious and omnipresent Anna Riva spell books. (How many Pagans have looked those books and said “What??? This is Christian!!! !”) Along with explaining the basics of serving the loa and how respect and reciprocity is a powerful keystone to it all, she generously shares recipes, tables explaining how ingredients are used and even instructions on proper disposal of material after ritual – an often skipped step in mainline Wicca and “white witchcraft” books. The book is a straightforward reference for a person putting together his or her own magic working. It won’t make you a Conjure man or woman, but it will give you an excellent tool of reference when working for yourself.